The first Orders of Chivalry were formed during the 12th Century. The first of these was the Military Order of Malta. From this Order, others were formed such as the Order of Saint John (Knights Hospitaller) in 1080, the Military Order of the Temple of Jerusalem (Knights Templar) in 1119, the Order of Saint Lazarus in 1100, and the Order of Saint Mary's Hospital in Jerusalem (Teutonic Knights) in 1190. These orders were groups of Knights who banded together to create their own fraternal organization. These organizations were either sponsored by the Monarch of their home countries, or by the Pope (who is a sovereign power of himself). Each member of their organizations typically took vows and in essence became warrior monks. In 1291, when the last stronghold of Christendom fell to the Arabs, the missions of the Orders of Chivalry became obsolete. They now had neither hospitals to run, pilgrims to protect, or mission to achieve. Some Orders, like the Teutonic Knights, survived because they had already settled in eastern Europe. Others, like the Knights Hospitaller, conquered Malta and became a naval power and continued to wage war against the Arabs and later the Turks. Yet others, like the Knights Templar, tried to make a transition to become bankers (they also tried to merge with the Order of Saint John). However, because of their wealth, the French Monarchy falsely accused them of heresy and successfully disbanded the Order in 1312. The Templar’s' existence was tied closely to the Crusades; when the Holy Land was lost, support for the Order faded. Rumors about the Templar’s' secret initiation ceremony created mistrust, and King Philip IV of France, deeply in debt to the Order, took advantage of the situation. In 1307, many of the Order's members in France were arrested, tortured into giving false confessions, and then burned at the stake. Under pressure from King Philip, Pope Clement V disbanded the Order in 1312. The abrupt disappearance of a major part of the European infrastructure gave rise to speculation and legends, which have kept the "Templar" name alive into the modern day. The Sovereign Military Order of St John of Jerusalem, of Rhodes and of Malta, also known as the Order of Malta, the Order of St John of Jerusalem, or simply the Hospitallers, is a unique international confraternity. It is the only organization currently recognized, albeit by a minority of states, as quasi-sovereign. The Order of Malta is now dedicated to medical and charitable activities. The Teutonic Order became a simple religious order in 1929. The Order of Saint Lazarus split into two factions with one being protected by the French Crown and one protected by the House of Savoyard. The French faction was abolished by Louis XVI in 1791. There are many organizations today that claim to be descended from each of these orders. Between 1335 and 1400, there was a rise in Monarchical Orders of Chivalry. Some of these orders still exist today. 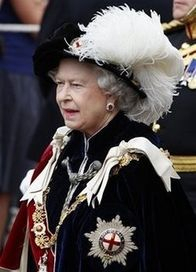 For example the Order of the Garter is an Order of Chivalry created by the British Crown. Over time, with the development of new ways to wage war, the Knights profession transformed into the modern soldier. With new technologies and the need for vast numbers of highly trained soldiers, the title of Knight became primarily honorific by the mid 1500's. By this time, only the Order of the Garter in England, the Order of the Golden Fleece in Spain, the Order of Annunziata in Savoy, and the Order of Saint Michael in France remained. Because knighthood was more of a professional association, knights were not necessarily nobles. The noble class and the knightly class began to merge in the 12th century. 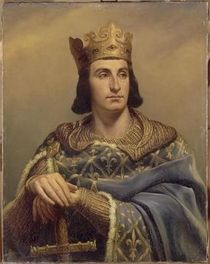 In the 13th century heredity enters into the knightly class, and more and more nobles were being knighted, to include royalty, for example Louis VI. With heredity being a part of knighthood, a son of a knight automatically became a squire and eligible for knighthood. By the late 13th century, laws were also enacted which greatly imposed restrictions on who could become a knight, for example the Parliament in Paris forbade a count from making un free men knights without the approval of the king. In England, anyone who held land in a knight's fee could pay a tax if they did not want to become a soldier. Also, as an interesting note, knighthood in England did not become a hereditary class, as in the rest of Europe. Chivalric orders are orders of knights that were created by European monarchs in imitation of the military orders of the Crusades. After the crusades, the memory of these crusading military orders became idealized and romanticized, resulting in the late medieval notion of chivalry, and is reflected in the Arthurian romances of the time. Chivalric Terminology. "The terms are often confused, and often needlessly distinguished. The term knighthood comes from the English word knight (from Old English cniht, boy, servant, cf. German Knecht) while chivalry comes from the French chevalerie, from chevalier or knight (Low Latin caballus for horse). In modern English, chivalry means the ideals, virtues, or characteristics of knights. The phrases "orders of chivalry" and "orders of knighthood" are essentially synonymous. The German translation for "knight" is Ritter (literally, rider). The Latin term in the Middle Ages was miles, since a knight was by definition a professional soldier. In modern times, the Classical Latin term eques was preferred." Chivalry was a feature of the High and later Middle Ages in Western Europe. While its roots stretch back to the 9th and 10th centuries, the system of chivalry flourished most vigorously in the 12th and 13th centuries before deteriorating at the end of the Middle Ages. However, the ideals of chivalry continued to influence models of behavior for gentlemen and the nobility during the Renaissance in the 16th century. Chivalric ethics originated chiefly in France and Spain and spread rapidly to the rest of the Continent and to England. They represented a fusion of Christian and military concepts of morality and still form the basis of gentlemanly conduct. Noble youths became pages in the castles of other nobles at the age of 7; at 14 they trained as squires in the service of knights, learning horsemanship and military techniques, and were themselves knighted, usually at 21. The ideal of militant knighthood was greatly enhanced by the Crusades . The monastic orders of knighthood, the Knights Templars and the Knights Hospitalers , produced soldiers sworn to uphold the Christian ideal. Besides the battlefield, the tournament was the chief arena in which the virtues of chivalry could be proved. The code of chivalrous conduct was worked out with great subtlety in the courts of love that flourished in France and in Flanders. There the most arduous questions of love and honor were argued before the noble ladies who presided (see courtly love ). The French military hero Pierre Terrail, seigneur de Bayard , was said to be the last embodiment of the ideals of chivalry. The early Middle Ages had been a chaotic time in Europe. The Crusades were military expeditions undertaken by Christian knights to recapture from Muslim control the holy places of pilgrimage in Palestine, or the Holy Land. Although many knights enlisted in search of financial gain, military glory, and adventure, many were also moved by genuine religious enthusiasm. This enthusiasm was reflected in the founding of the military religious orders-the Knights Templar, the Teutonic Knights, and the Hospitalers. The members of these orders took religious vows and shared a common vision of recapturing the Holy Land for Christianity. These orders helped infuse chivalry with religious idealism. The chief chivalric virtues were piety, honor, valor, courtesy, chastity, and loyalty. The knight's loyalty was due to the spiritual master, God; to the temporal master, the suzerain; and to the mistress of the heart, his sworn love. Love, in the chivalrous sense, was largely platonic; as a rule, only a virgin or another man's wife could be the chosen object of chivalrous love. With the cult of the Virgin Mary, the relegation of noblewomen to a pedestal reached its highest expression. In practice, chivalric conduct was never free from corruption, increasingly evident in the later Middle Ages. Courtly love often deteriorated into promiscuity and adultery and pious militancy into barbarous warfare. Moreover, the chivalric duties were not owed to those outside the bounds of feudal obligation. The outward trappings of chivalry and knighthood declined in the 15th cent., by which time wars were fought for victory and individual valor was irrelevant. Artificial orders of chivalry, such as the Order of the Golden Fleece (1423), were created by rulers to promote loyalty; tournaments became ritualized, costly, and comparatively bloodless; the traditions of knighthood became obsolete. In the 15th and 16th centuries, chivalric ideals and customs continued to survive among the European nobility. By this time their importance consisted largely of keeping alive the memory of the knight's warrior tradition and in serving as a mark of the nobility's social distinction. At the same time, literary figures throughout Europe began to utilize the code of chivalry to serve as a model for the nobility and gentlemen at court. In Renaissance Italy, Baldassare Castiglione used his Book of the Courtier, published in 1528, to fashion his advice for men and women at court based on knightly etiquette. In the two centuries that followed, many writers fashioned similar advice for both courtiers and worldly gentlemen. By the beginning of the 19th century, the figure of the knight had become romanticized. Writers saw the knight as pioneering the concept of romantic love and representing the highest expression of Christian ideals and civility. In the 19th century, romantic authors like Sir Walter Scott began to attribute modern manners to medieval knights. Their work shows the ongoing adaptation and vigor of the concept of chivalry, a concept that continued to undergo significant historical development long after the age of medieval knights had passed. 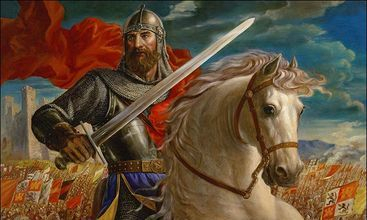 One of the greatest examples of chivalry in literature is Sir Gawain. He epitomizes the chivalric code. In the work, Sir Gawain and the Green Knight, Gawain received a test of his honor. In the midst of the New Year's celebration at King Arthur's Camelot, a man of mighty stature comes to challenge the Knights of the Round Table. This Green Knight comes to prove the honor and reputation of King Arthur's Court. Medieval secular literature was primarily concerned with knighthood and chivalry. Two masterpieces of this literature are the Chanson de Roland (c.1098; see Roland ) and Sir Gawain and the Green Knight (see Pearl, The ). Arthurian legend and the chansons de geste furnished bases for many later romances and epics. The work of Chrétien de Troyes and the Roman de la Rose also had tremendous influence on European literature. The endless chivalrous and pastoral romances, still widely read in the 16th cent., were satirized by Cervantes in Don Quixote. In the 19th cent., however, the Romantic Movement brought about a revival of chivalrous ideals and literature. 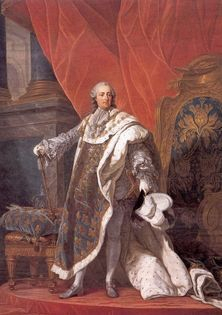 Above: Louis XV, King of France from 1715 to 1774 King Louis XV of France (1710–1774) is shown wearing the royal robes. 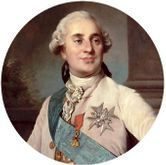 Around his neck are the collars and insignia of two orders of chivalry - the Spanish Order of the Golden Fleece, and the French Order of Saint-Louis. The white 8-pointed cross of the latter order was awarded to many Canadian soldiers during the French regime in Canada. (National Archives of Canada C604). The Order of the Most Holy Annunciation, founded by Amadeus VI, Count of Savoy in 1362. The Order of the Stoat, founded by John V, Duke of Brittany in 1381: First order to accept Women. Alliance et Compagnie du Levrier, founded by 44 knights in the Barrois (1416–1422), subsequently converted into the Confraternal order of Saint Hubert. Consequently to the fact of being not an order of chivalry but an order of merits, some republican orders have created new ranks: e.g. Order of Merit of the Federal Republic of Germany. Self-styled orders are organizations that claim to be chivalric orders in the same sense as such orders as the Austrian Order of the Golden Fleece or the French Order of Saint Michael, which actually are able to convey knighthood. The "self-styled orders" are membership organizations and have not been created by a State or a Monarch. With few exceptions, self-styled orders began to arise in the middle of the eighteenth century, and they continue to emerge. Some are short-lived and only last a few decades. There are differing opinions about what principles or rules should be applied to distinguish an organization as a genuine chivalric order or a merely self-styled one. Most scholars agree that a chivalric order (that is, an order which can bestow knighthood) must have a fons honorum ("fount of honor") which is provided both by its founder and current principal patron in order for it to be considered a true chivalric order. A fount of honor is defined as someone who held sovereignty either currently or formerly at the time of the creation of the order. 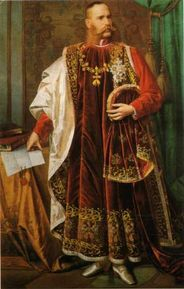 Further, former holding of sovereignty is considered allowable only for the creation of an order in those cases where the former sovereign did not abdicate his position: for example, an Order of St John of Jerusalem which previously was merely a self-styled "order" came to be supported by the exiled King Peter of Yugoslavia, who had not abdicated; after the king's death in 1970, his successor, Crown Prince Alexander, refused to continue patronage and in fact repudiated the various and competing successor "orders"; thus, without a continuing fons honorum, these orders lapsed back into "self-styled" status. A minority of scholars disagree, arguing that a non-reigning claimant to a throne cannot continue an order of chivalry. There are many other organizations that call themselves one variation or another of the name “Order of St. John”. These other organizations have no historical connection with the original Roman Catholic order or with a monarchy, in spite of their assertions of such connections. Due to the well-documented histories of the recognized orders and the demise of the Russian Grand Priory, these other organizations typically claim to have a pedigree via the Russian Grand Priory. In fact, none exists. These organizations are typically referred to as the “self-styled orders” and are, in effect “mimic orders” with no standing as Orders of Knighthood. The Order of Saint John of Jerusalem, Knights Hospitaller. As organized under the Charter or Constitution of King Peter II of Yugoslavia. The King Peter Order was essentially a schismatic break-away from the Cassagnac Order and was formed in April 1965. The "King Peter Constitution" of 1964, (and the earlier "Charter" of 1963), had been framed for the Cassagnac Order, and the King's supporters sought to replace de Cassagnac as Grand Master. Having elected King Peter as Grand Master in January 1965, the King's supporters asked de Cassagnac to step down, but he refused, and instead King Peter resigned from the Cassagnac Order and formed his own, taking with him a substantial part of the Cassagnac Order. In 1968, through internal arguments the King Peter Order split into three factions, and with difficulty re-united, only to fragment again following the King's death in 1970, into several groups, some of which in turn fragmented further bringing about a number of Orders which claim to be "The King Peter" Order of St John of Jerusalem. On this web site there is a fuller history available. Some organizations have provided a false fons honorum to satisfy the need. In these cases, the founder or patron of the "order" has essentially assumed a false title of nobility in addition to assuming some sort of sovereignty, current or former. Although not recognized by any international treaty, an organization exists which seeks to provide criteria against which to judge Orders of Chivalry: the International Commission for Orders of Chivalry (ICOC) The rules by which the Commission adjudges an order of chivalry to be genuine are listed on the website of the Commission. The Commission is an independent organization, though neither its decisions nor the criteria it employs to reach those decisions are universally accepted. The Commission has no standing in international law and may not be acknowledges by any present government. There are organizations that appear to have a chivalric character and are seen as being akin to orders of chivalry, of: Guy Stair Sainty, World Orders of Knighthood & Merit, Burke's Peerage & Gentry, 2006. The temporal power of the Popes is the political and governmental activity of the Popes of the Roman Catholic Church, as distinguished from their spiritual and pastoral activity, which is also called eternal power, to contrast it with the Church's secular power. The temporal power was abolished by Napoleon Bonaparte, who dissolved the Papal States and incorporated Rome and Latium into his French Empire. The temporal power was restored by the Great Powers at the 1815 Congress of Vienna. The Napoleonic civil laws were abolished, and most civil servants were removed from office. Popular opposition to the reconstituted corrupt clerical government led to numerous revolts, which were suppressed by the intervention of the Austrian army. When Pius IX was elected pope in 1846, one of his first acts was to grant an amnesty to more than 2,000 political prisoners. In November 1848, following the assassination of his minister Pellegrino Rossi, Pius IX fled Rome. During a political rally in February 1849, a young Roman priest, the Abbé Arduini, described the temporal power of the popes as a "historical lie, a political imposture, and a religious immorality." [Jasper Ridley, Garibaldi, p. 268]. On 9 February 1849, the newly-elected Roman Assembly proclaimed the Roman Republic (19th century). Subsequently, the Constitution of the Roman Republic abolished the temporal power, although the independence of the pope as head of the Catholic Church was guaranteed by article 8 of the "Principi fondamentali." Religious freedom was guaranteed by article 7, while the death penalty was abolished by article 5, and free public education was provided by article 8 of the "Titolo I". At the end of June 1849, the Roman Republic was crushed by 40,000 French troops sent by Louis Napoleon Bonaparte (later Napoleon III), at the urging of the rabid ultramontane French clerical party. The temporal power was restored and propped up by a French garrison. During the civil war of the Italian reunification in March 1861 the first Italian Parliament declared Rome the capital of the Kingdom of Italy. The Papal States were annexed to the Kingdom of Italy on 20 September 1870. The Pope became a prisoner in Rome. For practical purposes, the temporal power of the popes ended on 20 September 1870, when the Italian Army breached the Aurelian Walls at Porta Pia and entered Rome. This completed the Risorgimento. Negotiations for the settlement of the Roman Question began in 1926 between the government of Italy and the Holy See, and in 1929 they culminated in the agreements of the three Lateran Accords, signed for King Victor Emmanuel III of Italy by Prime MinisterBenito Mussolini and for Pope Pius XI by Cardinal Secretary of State Pietro Gasparri. The agreements were signed in the Lateran Palace, hence the name by which they are known. Formally, the temporal power ended in 1929 with the treaty between the Vatican State and Italy (Concordat), when the papacy accepted to have no more interests on Italy, its closest neighbor, and therefore on any other country. Of course, the influence of the Vatican still is relevant and evident, even now, and is mostly considered as a spiritual voice. Some small degree of temporal power persists in the formal government of the Vatican City as an independent state. In 1929 the Lateran Treaties created the state of the Vatican City and guaranteed full and independent sovereignty to the Holy See. The Pope was pledged to perpetual neutrality in international relations and to abstention from mediation in a controversy unless specifically requested by all parties. The Concordat established Catholicism as the religion of Italy. The financial agreement was accepted as settlement of all the claims of the Holy See against Italy arising from the loss of temporal power in 1870. Since its foundation, the Order of the Garter has included the Sovereign and Knights Companions. The Sovereign of the United Kingdom serves as Sovereign of the Order. The Prince of Wales is explicitly mentioned in the Order's statutes and is by convention created a Knight Companion; aside from him, there may be up to twenty-four other Knights Companions. In the early days of the Order, women (who could not be knighted), were sometimes associated with the Order under the name "Ladies of the Garter," but they were not full companions. Henry VII, however, ended the practice, creating no more Ladies of the Garter after his mother Margaret Beaufort, Countess of Derby (appointed in 1488).